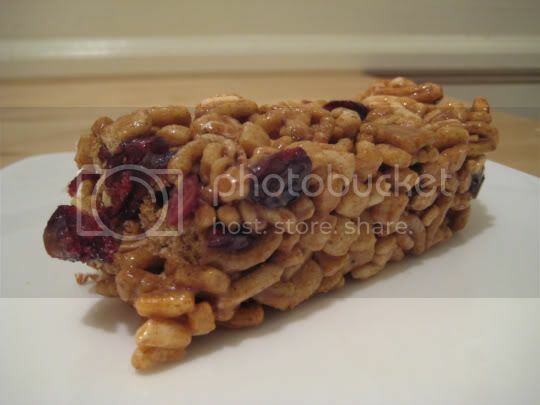 Yay, my very own homemade cereal-fruit-energy-fiber-health bars! These were delicious and super filling. One bar (well, more on that later) kept me full all the way until lunch, so that's at least a good four hours. And these bars were also really easy to make: mix together puffed cereal (I used Kashi Go Lean), dried fruit (cranberries and raisins), and cinnamon; melt almond butter, brown rice syrup (or honey), and butter together; pour over cereal mixture and stir; press into a pan; refrigerate overnight (this was best to keep them together); and you're done! It's like making healthy Rice Krispies treats! Well...the almond butter adds a pretty high amount of fat, but hey, it's the good fat, right? Coworkers raved about them, although one suggested they could "use more glue." They did get crumbly, and certainly were not sticky-sticky like Rice Krispies treats. But the taste made up for any texture problems. The crunchiness of the cereal, with the tart and sweet chewiness of the dried fruit, with the nutty and sweet flavors...all of that made for an excellent treat. One strange thing: the recipe says it "serves 4," yet it also directs you to cut the bars into 15 pieces. Well, the math doesn't quite work for that one. I cut the bars (in a 9x9" pan) into 8 BIG pieces...and one of these BIG pieces (which was really like eating 2 servings) was more than enough. I think the recipe probably meant cut into 16 pieces...but that still serves WAY more than 4 people. A piece 1/16th of the pan is more like a snack, and 1/8th of the pan is a full breakfast meal. Make again? Yes, probably experimenting with different cereal, fruit, and "glues."